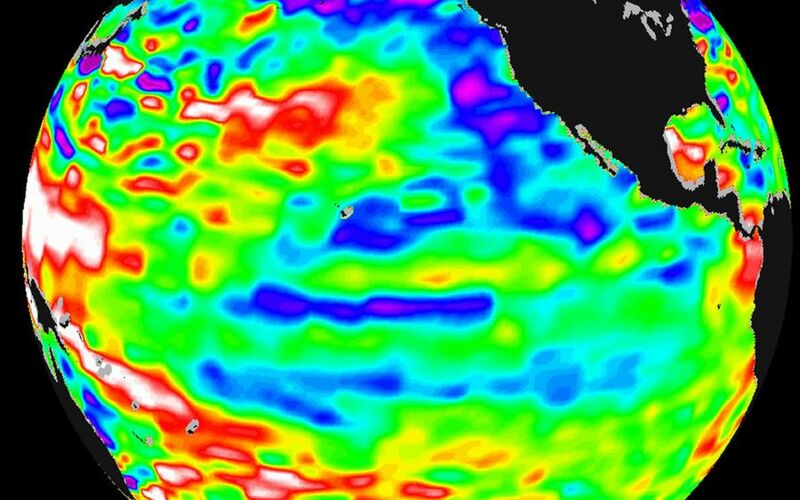 After dominating the tropical Pacific Ocean for more than two years, the 1998-2000 La Niña "cool pool" is continuing its slow fade and seems to be retiring from the climate stage, according to the latest satellite data from the U.S.-French TOPEX/Poseidon mission. The blue areas are between 5 and 13 centimeters (2 and 5 inches) below normal, whereas the purple areas range from 14 to 18 centimeters (6 to 7 inches) below normal. 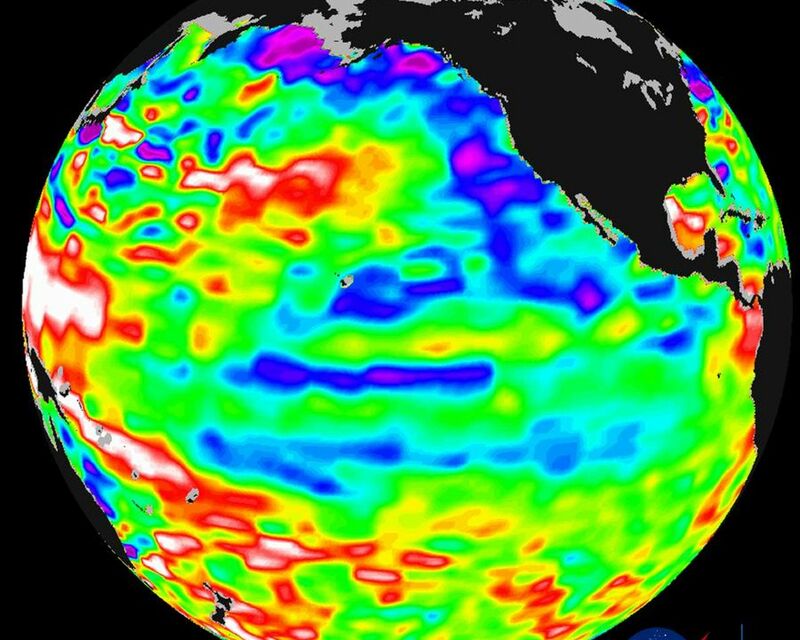 In the far-western tropical Pacific Ocean, the ocean remains higher and warmer than normal. 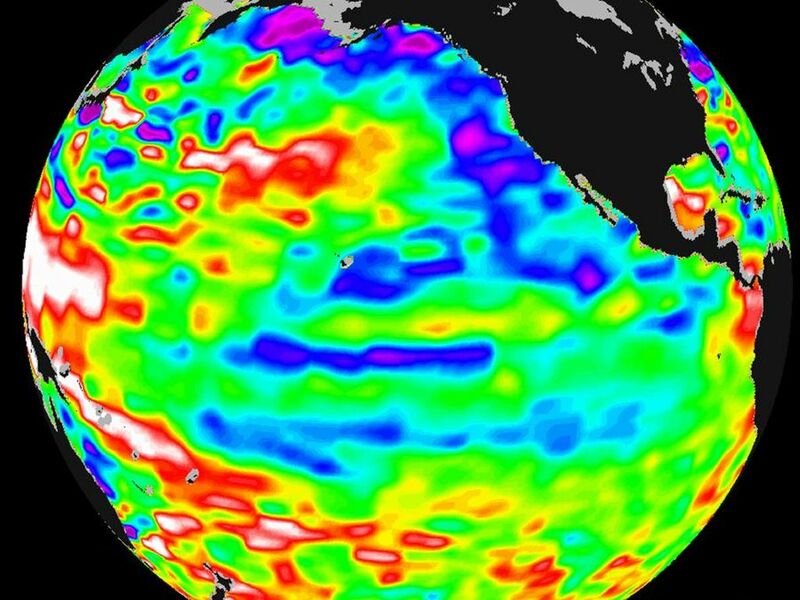 In summary, it appears that the global climate system is finally emerging from the past three years of dramatic swings from the extra-large El Niño of 1997/1998, which was followed by two unusually cool and persistent La Niña years, according to scientists at NASA's Jet Propulsion Laboratory. But as the northern hemisphere summer begins, above-normal sea surface heights and warmer ocean temperatures (indicated by the red and white areas) still blanket the western equatorial Pacific and much of the north and south mid-Pacific. Red areas are about 10 centimeters (4 inches) above normal; white areas show the sea surface height is between 14 and 32 centimeters (6 to 13 inches) above normal. This contrasts with the Bering Sea and Gulf of Alaska region southward along the western coast of North America, where lower-than-normal sea levels and cool ocean temperatures continue, although this pattern is also weakening. A possible switch in this larger-than-El Niño/La Niña, slower-changing pattern -- the Pacific Decadal Oscillation -- was first noticed by many scientists in late 1998. 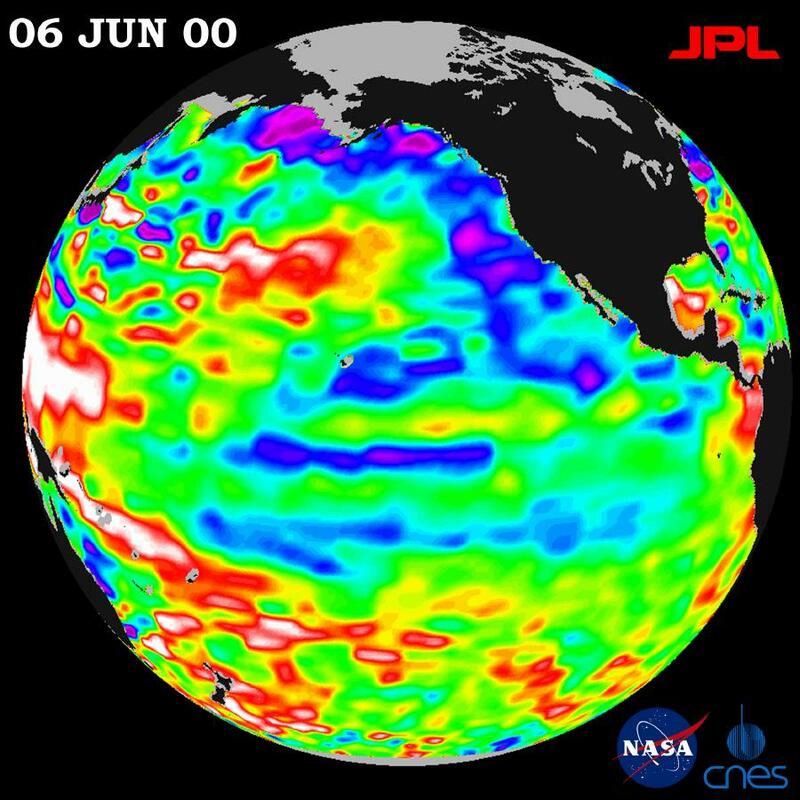 See a January 2000 press release on that topic at http://www.jpl.nasa.gov/elnino/20000118.html, or for further information and graphics about the Pacific Decadal Oscillation, see http://topex-www.jpl.nasa.gov/discover/PDO.html. "Let's not forget that the legacy of two years of La Niña will be with us this summer and into the fall," said JPL oceanographer Dr. William Patzert. "Much of the nation's farmland is really dry in many regions. The reality is that the atmosphere is still acting as though La Niña remains." The National Oceanic and Atmospheric Administration's (NOAA) National Weather Service has forecasted continuing drought for much of the midwestern and southeastern United States and an active hurricane season for our coming summer. NOAA seasonal forecasts can be found at http://www.cpc.ncep.noaa.gov. The U.S.-French TOPEX/Poseidon mission is managed by JPL for the NASA's Earth Science Enterprise, Washington, D.C. JPL is a division of the California Institute of Technology in Pasadena.